A story by Kristen Bealer that drew inspiration from one of the family photos in The Daria Diaries. 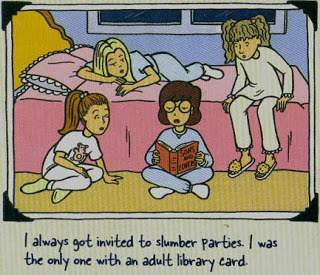 Ten-year-old Daria Morgendorffer finds herself suddenly popular when the other girls in her grade learn that she has an adult library card. While she initially enjoys the attention and likes the fact that the other children are reading, she becomes concerned about what they are reading. This story was a well-deserved multiple winner in the 3rd Daria FanWorks Awards recieving Booties for "Favorite Overall", "Favorite Dramatic Comedy", and "Favorite Pre-Esteemsters." It was also nominated for "Favourite Comedy" and "Favorite Character Development/Redevelopment/Growth." This page was last edited on 14 May 2018, at 20:30.